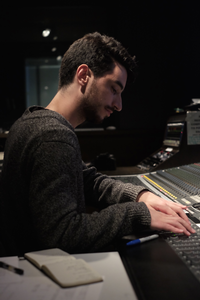 Mike Tierney is a Brooklyn-based audio engineer and producer. He studied jazz composition and performance at Clark University and music technology at New York University. His strong musical background has helped him in developing his niche in the jazz, indie, and new music scenes, having worked with artists such as Julia Wolfe, Nels Cline, Medeski Martin & Wood, Ron Carter, So Percussion, Alarm Will Sound, Kenny Werner, and Joe Lovano.